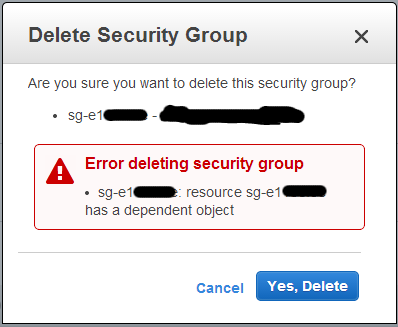 If you spend a moderate amount of time creating and modifying AWS security groups, you will inevitably encounter the “Error deleting security group sg-12345678: resource sg-12345678 has a dependent object” error message. From there, I opened the securitygroups.txt file in vim and searched for sg-12345678. One entry is for the security group itself and all other matches are for security groups that include the group I want to delete. It’s also possible that the group is attached to a network interface. I found the solution for this situation here.